Atrial fibrillation (AF) is the most common arrhythmia worldwide and has an enormous impact on our healthcare system as it is a major contributor of morbidity and mortality. Although there are several therapeutic options available, treatment of AF still remains challenging. AF pathophysiology is complex and still incompletely understood. In general, our understanding of AF is based on two mechanistic paradigms as functional hallmarks of AF: ectopic activity and reentry. Both ectopic activity and reentry are the result of remodelling processes. Functional and/or expressional changes in ion channels, connexins or calcium-handling proteins are important factors in electrical remodelling, whereas signalling processes leading to atrial dilatation and atrial fibrosis are key factors of structural remodelling. In recent years, new intriguing key players in AF pathophysiology have been identified: microRNAs (miRNAs). MiRNAs are short, non-coding RNA fragments that can regulate gene expression and have been demonstrated as important modifiers in signalling cascades leading to electrical and structural remodelling. 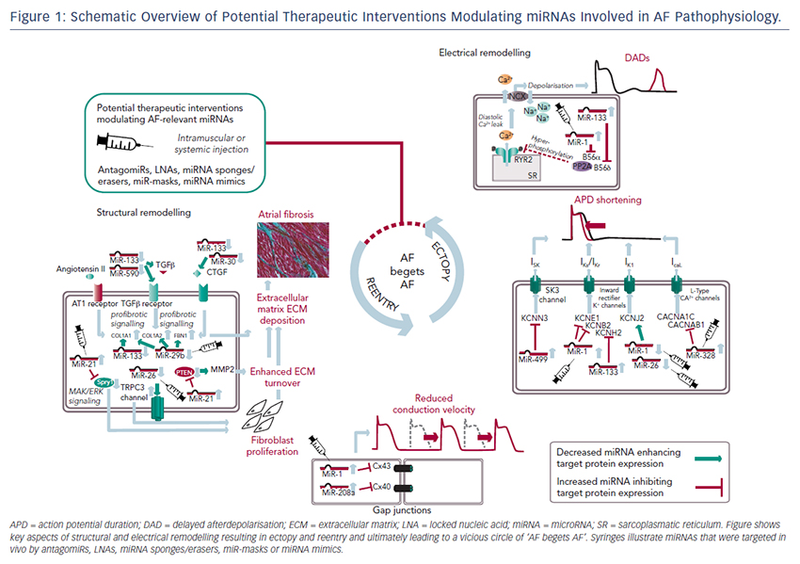 In this article we review the miRNA-mediated molecular mechanisms underlying AF with special emphasis on the perspective of miRNAs as potential therapeutic targets for AF treatment. Dr Clauss has received funding from the People Programme (Marie Curie Actions) of the European Union’s Seventh Framework Programme (FP7/2007-2013) under REA grant agreement No PIOF-GA-2012-328352. Dr Clauss, Dr Wakili and Dr Kääb were supported by the German Centre for Cardiovascular Research (DZHK). Dr Wakili, Dr Sinner and Dr Kääb received funding from the European Union’s Horizon 2020 research and innovation programme under grant agreement No 633193” [CATCH ME]. Current therapeutic options include non-invasive treatment using antiarrhythmic agents and invasive methods using catheter ablation.3,4 Although several improvements have been achieved, challenges still remain. Pulmonary vein isolation is now an established treatment, especially for patients with paroxysmal AF, but success rates (freedom from AF) in persistent AF are still insufficient.3,5,6 To further improve AF treatment, mechanisms underlying AF initiation and maintenance have to be further elucidated to better enable identification of the most suitable treatment strategy for each individual patient (in terms of drug toxicity, freedom of AF symptoms and improved quality of life) and recognition of patients at high risk for AF. In recent years our understanding of AF pathophysiology has markedly improved by the identification of key players in cardiovascular signalling: microRNAs (miRNAs).7 We will provide a comprehensive overview of the role of miRNAs in AF and their potential therapeutic implications. The pathophysiological basis of AF is multifactorial and complex.8,9 Electrophysiological hallmarks of AF are ectopic activity and reentry as the functional surrogates for trigger and susceptible substrate. Underlying molecular mechanisms include changes in expression and function of ion channels, altered calcium homeostasis, enhanced atrial automaticity, alterations in gap junction distribution, and adverse effects on atrial integrity such as dilatation, fibrosis or inflammation. These mechanisms are summarised as electrical and structural remodelling, and will be described here briefly. Three main mechanisms causing focal ectopic activity are: enhanced atrial automaticity, early afterdepolarisations and delayed afterdepolarisations. Under normal physiological conditions, generation and conduction of electrical impulses in the heart is implemented by a characteristic sequence of voltage changes driven by depolarising and repolarising ion currents. Cardiomyocytes display a resting membrane potential of around -80 mV. An electrical impulse causes a swift depolarisation by rapidly activated sodium channels with subsequent influx of sodium ions. Following this, potassium ions exit the cell through potassium channels, initiating the repolarisation of the cell (re-establishing the resting membrane potential). Simultaneously, calcium ions enter the cell leading to cell contraction (excitation– contraction coupling) and slowing of the repolarisation. In 1993 it was discovered that development of Caenorhabditis elegans is regulated by a short RNA fragment named Lin-4 that inhibits the expression of lin-14 by binding to the 3’ untranslated region of its mRNA.15,16 In the following years, these miRNAs were identified as key players in molecular signalling leading to disease. Although other noncoding RNA species have been discovered so far,17,18 we will focus on miRNAs in this review. MiRNAs involved in cardiac electrical remodelling are miR-1, miR-26, miR-208a, miR-328 and miR-499 (Table 1, Figure 1). Their target genes are encoding ion channels, connexins or proteins involved in calcium signalling resulting in conduction slowing or shortening of the action potential duration, which are hallmarks of AF pathophysiology. MiR-1 and miR-133 are muscle-specific (skeletal and heart) miRNAs that are expressed from bicistronic clusters and, therefore, are among the most abundant miRNAs in the heart.28 Girmatsion et al. showed that miR-1 is downregulated in the heart of patients with persistent AF compared with patients with sinus rhythm.29 They demonstrated that this downregulation of miR-1 is accompanied by a significant upregulation of its target gene KCNJ2 that encodes Kir2.1, the subunit of the inward rectifier potassium channel IK1. Additionally, they showed that an ex vivo tachystimulation of atrial tissue resulted in downregulation of miR-1 and upregulation of Kir2.1 protein and IK1 density. An increased IK1 density is associated with a shortening of the APD and could therefore enable reentry and AF maintenance. Yang et al. indicated another role for miR-1 in arrhythmogenesis as they confirmed KCNJ2 as an miR-1 target gene, but also identified GJA1 as an additional target gene that encodes connexin-43.30 They performed a miR-1 overexpression in an ischaemic rat model (which is in contrast to the miR-1 downregulation in patients with AF). Overexpressing miR-1 in the rat model led to downregulation of KCNJ2 and GJA1 resulting in APD prolongation and conduction slowing. In 2013, Jia and colleagues published a study evaluating the role of miR-1 in rabbits.31 They performed right atrial tachypacing in rabbits for 1 week resulting in increased inducibility of AF due to a shortening of the atrial effective refractory period and an increase in the slowly activating delayed rectifier potassium current (IKs). They found an upregulation of miR-1 paralleled by a downregulation of KCNE1 (coding for the voltage-gated potassium channel subfamily E member 1, minK) and KCNB2 (coding for the voltage-gated potassium channel subfamily B member 2, Kv2.2). Using anti-miR-1 inhibitor oligonucleotides, they rescued the phenotype and prevented expressional changes of miR-1, KCNE1 or KCNB2. MiR-26 has also been shown to regulate gene expression of KCNJ2.34,35 In a canine AF model and in human atrial samples, miR- 26 is downregulated while Kir2.1 is upregulated. Overexpression of miR-26 resulted in suppressed KCNJ2 expression, miR-26 knockdown resulted in enhanced KCNJ2 expression. These results were confirmed in a mouse model performing virus-induced miR-26 overexpression and miR-mask induced miR-26 knockdown:35 reduced/enhanced AF vulnerability was observed in miR-26 overexpression/knockdown. Recently, Chiang and colleagues identified the miR-106b-25 cluster (miR-25, miR-93 and miR-106b) as mediators of electrical remodelling.36 They showed a downregulation in the atria of patients with AF and found an increased susceptibility for AF in miR-106b-25-knockout mice due to increased SR calcium release (SR calcium leak) mediated by an enhanced ryanodine receptor expression (which is the confirmed target gene of miR-93). Matkovich et al. generated a miR-133 overexpressing mouse that displayed QT/APD prolongation and a reduced outward potassium current Ito,f.38 Although they could measure a reduced expression of the Ito,f subunit KCNIP2, they did not validate this gene as a miR-133 target. Belevych et al. recently published a study in a canine model of heart failure.33 They demonstrated that miR-133 is upregulated leading to downregulation of its target gene B56δ, a catalytic subunit of PP2A with similar effects as B56α (that is downregulated as a target gene of miR-1, see above). MiR-208 is an interesting miRNA as the two isoforms (miR-208a and miR-208b) are differentially expressed during cardiogenesis.39 MiR- 208a is encoded within an intron of the α-cardiac muscle myosin heavy chain gene MYH6 (adult isoform), whereas miR-208b is encoded within an intron of the β-cardiac muscle myosin heavy chain gene MYH7 (fetal isoform). MiR-208 isoforms are expressed along with their host genes: miR-208b is expressed during cardiogenesis while miR- 208a is expressed in adult hearts. Interestingly, pathological cardiac remodelling is associated with the induction of a fetal gene expression pattern with re-expression of MYH7 and, therefore, miR-208b.40,41 To evaluate miR-208 in cardiac remodeling, Callis et al. performed an overexpression of miR-208a in a mouse model and observed an increased vulnerability towards arrhythmias.40 They demonstrated that miR-208 targets GJA5 encoding the cardiac gap junction protein connexin-40 and therefore mediates pro-arrhythmogenic remodelling by altering gap junction expression. Another miRNA involved in calcium signalling is miR-328. It is upregulated in atrial tissue of patients with AF and in a canine AF model.42 CACNA1C and CACNB1, subunits of the L-type calcium channel, were identified as target genes of miR-328. In the canine model, an adenovirus-induced miR-328 overexpression caused reduced L-type calcium current and APD shortening and increased AF vulnerability. Knockdown of miR-328 with an antagomiR reversed these effects suggesting a potential role for miR-328 in cardiac electrical remodelling via the L-type calcium channel. 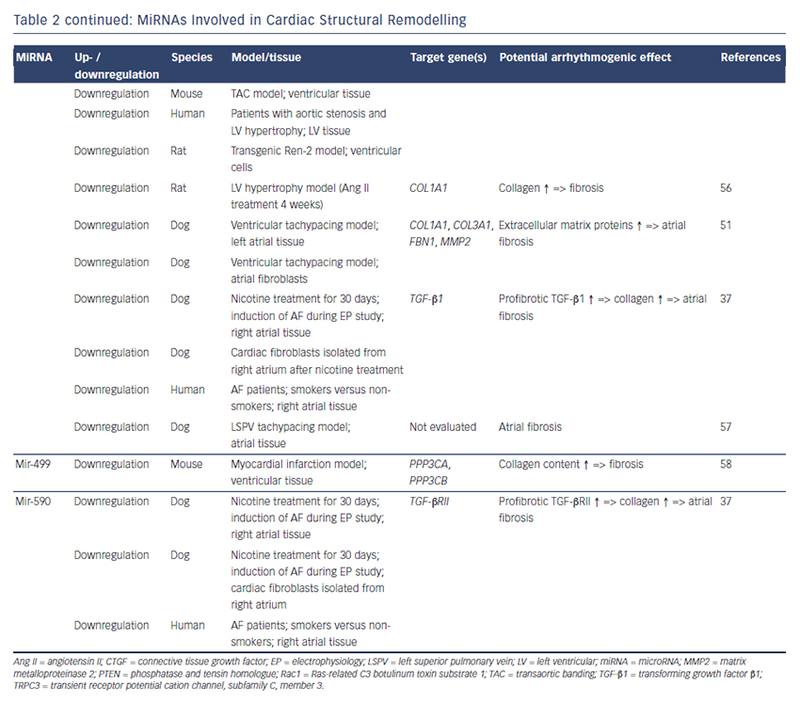 MiRNAs involved in cardiac structural remodelling are miR-21, miR- 26, miR-29b, miR-30, miR-133 and miR-590 (Table 2, Figure 1). These miRNAs regulate genes encoding proteins that are involved in extracellular matrix turnover and pro- or antifibrotic signalling cascades leading to atrial fibrosis as the anatomical substrate for reentry. A first report of miR-21 being involved in profibrotic signalling was published by Thum et al. in 2008.46 In a murine heart failure model, they showed that miR-21 is upregulated mostly in cardiac fibroblasts. By targeting sprouty homologue 1 (Spry1) miR-21 regulated the profibrotic ERK–MAP kinase signalling pathway. In vivo knockdown of miR-attenuates cardiac fibrosis and improves cardiac function. In a mouse model of myocardial infarction (MI), miR-21 was upregulated leading to repression of the transcription factor phosphatase and tensin homologue (PTEN).47 This blockade results in an upregulation of matrix metalloproteinase 2 (MMP2) and an enhanced matrix turnover suggesting a role for miR-21 in ventricular remodelling. Finally, miR-21 was detected to be upregulated in left atrial tissue of patients with AF.48 This was associated with reduced expression of Spry1 and increased expression of the profibrotic connective tissue growth factor (CTGF), lysyl oxidase and Rac1-GTPase, resulting in increased collagen content. Additionally, it could be shown in vitro that CTGF and angiotensin II induce an upregulation of miR-21. Finally, Adam and co-workers generated a Rac1-GTPase-knockout mouse and confirmed their previous results in that animal model suggesting a potential mechanism on the profibrotic action of angiotensin II via miR-21. Cardin et al. showed that miR-21 is upregulated in an ischaemic heart failure model in rats.49 Again, Spry1 was confirmed as the miR-21 target gene being downregulated. They injected a miR-21 antagonist directly into the left atria resulting in significant knockdown of miR-21, upregulation of Spry1, improvement of myocardial function, reduction of atrial fibrosis and, finally, reduced AF duration. Our group evaluated the role of several miRNAs in atrial remodelling in a canine AF model, in which heart failure is induced by ventricular tachypacing, leading to a subsequent atrial remodelling with increased susceptibility for AF.50 We showed that tachycardiomyopathy is associated with a significant upregulation of extracellular matrix proteins (collagen-1, collagen-3 and fibrillin) and a downregulation of MMP2 in left atrial tissue as well as in cardiac fibroblasts.51 These changes were accompanied by increased atrial fibrosis and an upregulation of miR-21. Other miRNAs that are discussed in detail below (miR-29b, miR-30a, miR-133a) were decreased in our model. In summary, several reports provide consistent evidence regarding a potential role of miR-21 on atrial structural remodelling and AF pathophysiology. Besides its role in electrical remodelling (described above), miR-26 is also reported to be involved in structural remodelling.34 In the canine ventricular tachypacing (VTP) model, miR-26 was downregulated in fibrillating atria causing an upregulation of transient receptor potential cation 3 (TRPC3) channels. These TRPC3 channels have been shown to be expressed in cardiac fibroblasts regulating calcium influx, cell proliferation, extracellular signal-regulated kinase phosphorylation and α-smooth muscle actin protein expression. In vivo blockade of TRPC3 channels prevented the development of an AF substrate in the canine VTP model. In 2008 van Rooij et al. reported a downregulation of miR-29b in a mouse model of MI that was accompanied with increased fibrosis and an upregulation of extracellular matrix proteins as collagen, fibrillin and elastin.53 They could reproduced their results in vitro by miR-29b overexpression and knockdown, respectively. Our group evaluated the role of miR-29b in atrial remodelling in the canine VTP model.50 After 24 hours of tachypacing, miR-29b was significantly downregulated in atrial tissue as well as in atrial fibroblasts and remained decreased throughout the time course (up to 2 weeks of ventricular pacing).54 Extracellular matrix proteins (collagen, fibrillin) were upregulated, atrial fibrosis was enhanced and the induced AF duration was significantly prolonged. Lentiviral miR-29b manipulation in fibroblasts mimicked the effects seen in the canine model: overexpression of miR-29b led to a downregulation and miR- 29b knockdown led to an upregulation of extracellular matrix proteins. Interestingly, we confirmed these changes (miR-29b downregulation) in right atrial tissue of patients with AF. Duisters et al. 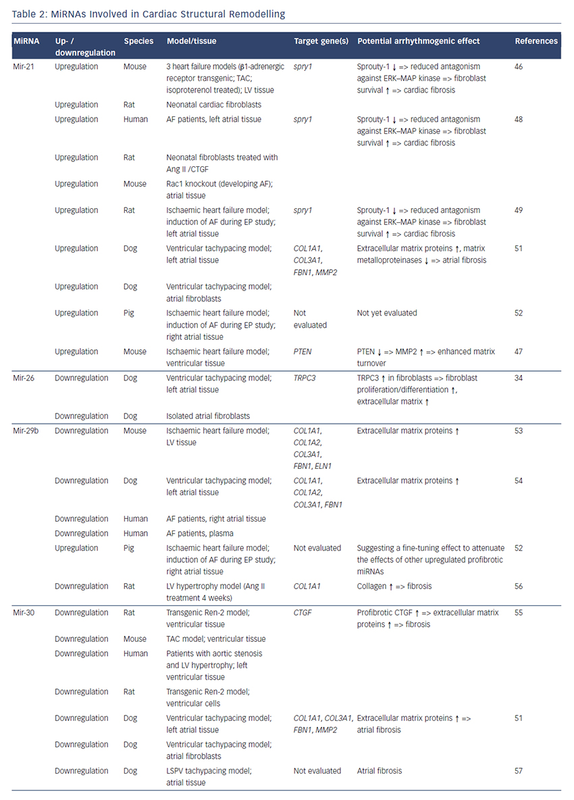 analysed ventricular tissue from rats (hypertensioninduced heart failure model) and mice (transaortic banding [TAC] model), rat cardiac cells and human ventricular biopsy samples (patients suffering from aortic stenosis with LV hypertrophy versus patients who have had coronary artery bypass grafting without LV hypertrophy).55 Their results were consistent over species: miR- 30c and miR-133 were downregulated, whereas their target gene CTGF, a profibrotic mediator, was upregulated. In vitro manipulation achieving miRNA overexpression/knockdown confirmed their results and provided evidence for a potential role of these miRNAs in structural remodelling. Castoldi et al. injected angiotensin II in rats for 4 weeks resulting in significant hypertrophy and fibrosis.56 They showed a downregulation of miR-133 and miR-29b paralleled by upregulation of collagen-1. All the effects were abolished when rats were treated with irbesartan, suggesting a role for miR-133/miR-29b in angiotensin-II induced cardiac remodelling. In an MI model in mice, Wang and co-workers observed a downregulation of miR-499 in the area at risk after ischaemia.58 For a further analysis, they produced a miR-499 transgenic mouse and observed improved cardiac function and reduced collagen content after MI. The catalytic subunits of calcineurin (PPP3CA, PPP3CB) were identified as target genes of miR-499. Further analysis revealed alterations in mitochondrial fission and apoptosis signalling as the potential mechanism underlying the miR-499 actions. Atrial remodelling was further investigated by Shan et al.37 They administered nicotine in dogs for 30 days resulting in significant increased atrial fibrosis and AF vulnerability compared with healthy dogs. The profibrotic mediator transforming growth factor b 1 (TGF- β1) and the TGF-β receptor-II (TGF-βRII) were significantly upregulated, whereas miR-133 and miR-590 were downregulated in the right atrium. They identified TGF-β1 as the target gene of miR-133 and TGF-βRII as the target gene of miR-590. In vitro manipulation confirmed their in vivo results (up-/downregulation of miR-133/miR-590 resulted in down-/ upregulation of TGF-β1/TGF-βRII/collagen). Finally, they examined right atrial tissue of AF patients and could show that miR-133/miR-590 were downregulated in smokers, suggesting a potential mechanism of the increased risk of AF in smokers. All potential therapeutic interventions are currently based on an intramuscular or systemic application of these agents in vivo. Figure 1 summarises the suspected mechanisms of miRNAs being involved in AF pathophysiology and illustrates potential interventions in order to interrupt the vicious circle of AF begets AF. These initial data and upcoming trials in humans are promising and justify further evaluation of miRNA therapeutics in AF, too. Based on the available data and suggested mechanisms of atrial fibrosis by miRNA action one focus could be the prevention or inhibition of progression of atrial fibrosis by targeting extracellular matrix-relevant miRNAs (e.g. miR-21 or miR-29b). However, several challenges remain including more detailed evaluation of underlying pathophysiological mechanisms, chemical optimisation of miRNA agents or refinement of drug delivery. Furthermore, miRNAs might also serve as diagnostic biomarkers for AF as shown in our study on miR-29b. We demonstrated a significant downregulation of miR-29b in the plasma of patients with persistent AF that was further aggravated in patients with AF and concomitant congestive heart failure.54 In case miRNAs could provide a representative biomarker for the existing structural changes or the predominant underlying pathophysiological mechanism this information could guide the choice of therapy in the individual patient. MicroRNAs are mediators of electrical and structural remodelling leading to AF. erasers, miR-masks (inhibiting miRNA effects) or miR mimics (enhancing miRNA effects). A first clinical phase IIa trial using an antagomiR for treatment of hepatitis C demonstrated it to be safe and effective for treatment of human patients. Upcoming clinical trials will be targeting miRNAs in the context of kidney fibrosis and coronary artery disease. Targeting miRNAs in patients might be a novel therapeutic option for treatment of AF. Wang TJ, Larson MG, Levy D, et al. Temporal relations of atrial fibrillation and congestive heart failure and their joint influence on mortality: the Framingham Heart Study. Circulation 2003;107:2920–5. Benjamin EJ, Chen PS, Bild DE, et al. Prevention of atrial fibrillation: report from a national heart, lung, and blood institute workshop. Circulation 2009;119:606–18. Dewire J, Calkins H. Update on atrial fibrillation catheter ablation technologies and techniques. Nature Rev Cardiol 2013;10:599–612. Gaita F, Caponi D, Scaglione M, et al. Long-term clinical results of 2 different ablation strategies in patients with paroxysmal and persistent atrial fibrillation. Circ Arrhythm Electrophysiol 2008;1:269–75. Willems S, Drewitz I, Steven D, et al. [Interventional therapy of atrial fibrillation: possibilities and limitations]. Deutsche Medizinische Wochenschrift 2010;135(Suppl 20:S48–54. Wakili R, Clauss S, Kaab S. [Molecular mechanisms of atrial fibrillation: potential role of microRNAs as new therapeutic targets and potential biomarkers]. Herz 2012;37:166–71. Nattel S. New ideas about atrial fibrillation 50 years on. Nature 2002;415:219–26. Wakili R, Voigt N, Kaab S, et al. 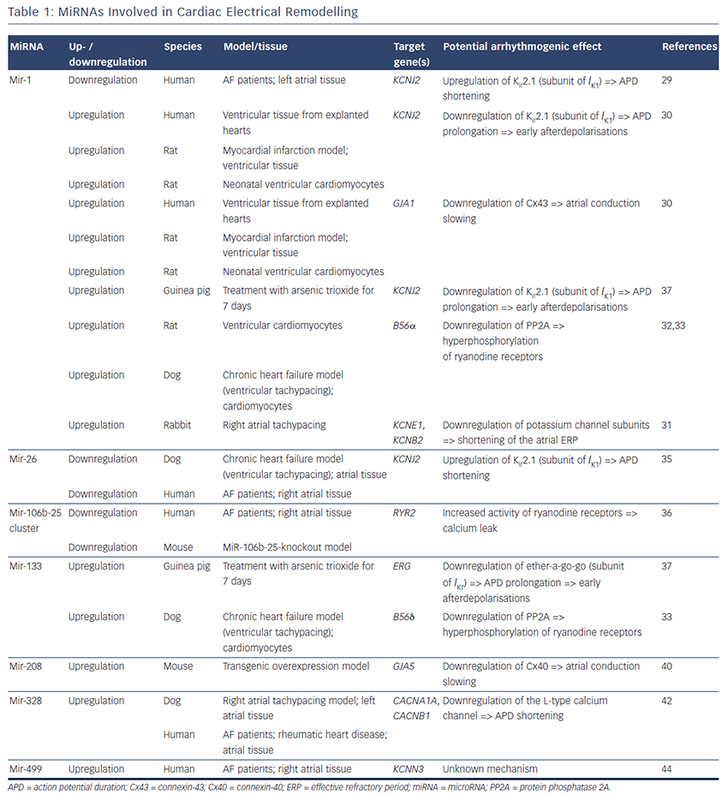 Recent advances in the molecular pathophysiology of atrial fibrillation. The J Clin Invest 2011;121:2955–68. Nattel S, Burstein B, Dobrev D. Atrial remodeling and atrial fibrillation: mechanisms and implications. Circ Arrhythm Electrophysiol 2008;1:62–73. Voigt N, Li N, Wang Q, et al. Enhanced sarcoplasmic reticulum Ca2+ leak and increased Na+-Ca2+ exchanger function underlie delayed afterdepolarizations in patients with chronic atrial fibrillation. Circulation 2012;125:2059–70. Lai LP, Su MJ, Lin JL, et al. Measurement of funny current (I(f)) channel mRNA in human atrial tissue: correlation with left atrial filling pressure and atrial fibrillation. J Cardiovasc Electrophysiol 1999;10:947–53. Allessie MA, Boyden PA, Camm AJ, et al. Pathophysiology and prevention of atrial fibrillation. Circulation 2001;103:769–77. Lee RC, Feinbaum RL, Ambros V. The C. elegans heterochronic gene lin-4 encodes small RNAs with antisense complementarity to lin-14. Cell 1993;75:843–54. Wightman B, Ha I, Ruvkun G. Posttranscriptional regulation of the heterochronic gene lin-14 by lin-4 mediates temporal pattern formation in C. elegans. Cell 1993;75:855–62. Chu CY, Rana TM. Small RNAs: regulators and guardians of the genome. J Cell Physiol 2007;213:412–9. Galasso M, Sana ME, Volinia S. Non-coding RNAs: a key to future personalized molecular therapy? Genome Med 2010;2:12. Ambros V. MicroRNAs: tiny regulators with great potential. Cell 2001;107:823–26. van Rooij E, Olson EN. MicroRNAs: powerful new regulators of heart disease and provocative therapeutic targets. J Clin Invest 2007;117:2369–76. Kozomara A, Griffiths-Jones S. MiRBase: annotating high confidence microRNAs using deep sequencing data. Nucleic Acids Res 2014;42(Database issue):D68–73. Flynt AS, Lai EC. Biological principles of microRNA-mediated regulation: shared themes amid diversity. Nature Rev Genet 2008;9:831–42. Bernstein E, Kim SY, Carmell MA, et al. Dicer is essential for mouse development. Nature Genet 2003;35:215–7. Wilkins BJ, Molkentin JD. Calcium-calcineurin signaling in the regulation of cardiac hypertrophy. Biochem Biophys Res Comm 2004;322:1178–91. da Costa Martins PA, Bourajjaj M, Gladka M, et al. Conditional dicer gene deletion in the postnatal myocardium provokes spontaneous cardiac remodeling. Circulation 2008;118:1567–76. Luo X, Xiao J, Lin H, et al. Transcriptional activation by stimulating protein 1 and post-transcriptional repression by muscle-specific microRNAs of IKs-encoding genes and potential implications in regional heterogeneity of their expressions. J Cell Physiol 2007;212:358–67. Girmatsion Z, Biliczki P, Bonauer A, et al. Changes in microRNA-1 expression and IK1 up-regulation in human atrial fibrillation. Heart Rhythm: the Official Journal of the Heart Rhythm Society 2009;6:1802–9. Yang B, Lin H, Xiao J, et al. The muscle-specific microRNA miR-1 regulates cardiac arrhythmogenic potential by targeting GJA1 and KCNJ2. Nature Med 2007;13:486–91. Jia X, Zheng S, Xie X, et al. MicroRNA-1 accelerates the shortening of atrial effective refractory period by regulating KCNE1 and KCNB2 expression: an atrial tachypacing rabbit model. PloS One 2013;8:e85639. Terentyev D, Belevych AE, Terentyeva R, et al. miR-1 overexpression enhances Ca(2+) release and promotes cardiac arrhythmogenesis by targeting PP2A regulatory subunit B56alpha and causing CaMKII-dependent hyperphosphorylation of RyR2. Circ Res 2009;104:514–21. Belevych AE, Sansom SE, Terentyeva R, et al. MicroRNA-1 and -133 increase arrhythmogenesis in heart failure by dissociating phosphatase activity from RyR2 complex. PloS One 2011;6:e28324. Harada M, Luo X, Qi XY, et al. Transient receptor potential canonical-3 channel-dependent fibroblast regulation in atrial fibrillation. Circulation 2012;126:2051–64. Luo X, Pan Z, Shan H, et al. MicroRNA-26 governs profibrillatory inward-rectifier potassium current changes in atrial fibrillation. J Clin Invest 2013;123:1939–51. Chiang DY, Kongchan N, Beavers DL, et al. Loss of microRNA- 106b-25 cluster promotes atrial fibrillation by enhancing ryanodine receptor type-2 expression and calcium release. Circ Arrhythm Electrophysiol 2014;7:1214–22. Shan H, Zhang Y, Lu Y, et al. Downregulation of miR-133 and miR-590 contributes to nicotine-induced atrial remodelling in canines. Cardiovasc Res 2009;83:465–72. Matkovich SJ, Wang W, Tu Y, et al. MicroRNA-133a protects against myocardial fibrosis and modulates electrical repolarization without affecting hypertrophy in pressureoverloaded adult hearts. Circ Res 2010;106:166–75. van Rooij E, Sutherland LB, Qi X, et al. Control of stressdependent cardiac growth and gene expression by a microRNA. Science 2007;316:575–9. Callis TE, Pandya K, Seok HY, et al. MicroRNA-208a is a regulator of cardiac hypertrophy and conduction in mice. J Clin Invest 2009;119:2772–86. Satoh M, Minami Y, Takahashi Y, et al. Expression of microRNA-208 is associated with adverse clinical outcomes in human dilated cardiomyopathy. J Cardiac Fail 2010;16:404–10. Lu Y, Zhang Y, Wang N, et al. MicroRNA-328 contributes to adverse electrical remodeling in atrial fibrillation. Circulation 2010;122:2378–87. Ellinor PT, Lunetta KL, Glazer NL, et al. Common variants in KCNN3 are associated with lone atrial fibrillation. Nat Genet 2010;42:240–4. Ling TY, Wang XL, Chai Q, et al. Regulation of the SK3 channel by microRNA-499--potential role in atrial fibrillation. Heart Rhythm: the Official Journal of the Heart Rhythm Society 2013;10:1001–9. Mahida S, Mills RW, Tucker NR, et al. Overexpression of KCNN3 results in sudden cardiac death. Cardiovasc Res 2014;101:326–34. Thum T, Gross C, Fiedler J, et al. MicroRNA-21 contributes to myocardial disease by stimulating MAP kinase signalling in fibroblasts. Nature 2008;456:980–4. Roy S, Khanna S, Hussain SR, et al. MicroRNA expression in response to murine myocardial infarction: miR-21 regulates fibroblast metalloprotease-2 via phosphatase and tensin homologue. Cardiovasc Res 2009;82:21–9. Adam O, Lohfelm B, Thum T, et al. Role of miR-21 in the pathogenesis of atrial fibrosis. Basic Res Cardiol 2012;107:278. Cardin S, Guasch E, Luo X, et al. Role for MicroRNA-21 in atrial profibrillatory fibrotic remodeling associated with experimental postinfarction heart failure. Circ Arrhythm Electrophysiol 2012;5:1027–35. Yeh YH, Wakili R, Qi XY, et al. Calcium-handling abnormalities underlying atrial arrhythmogenesis and contractile dysfunction in dogs with congestive heart failure. Circ Arrhythm Electrophysiol 2008;1:93–102. Chen Y, Wakili R, Xiao J, et al. Detailed characterization of microRNA changes in a canine heart failure model: Relationship to arrhythmogenic structural remodeling. J Mol Cell Cardiol 2014;77:113–24. van Rooij E, Sutherland LB, Thatcher JE, et al. Dysregulation of microRNAs after myocardial infarction reveals a role of miR-29 in cardiac fibrosis. PNAS 2008;105:13027–32. Dawson K, Wakili R, Ordog B, et al. MicroRNA29: a mechanistic contributor and potential biomarker in atrial fibrillation. Circulation 2013;127:1466–75, 1475e1461-1428. Duisters RF, Tijsen AJ, Schroen B, et al. MiR-133 and miR-30 regulate connective tissue growth factor: implications for a role of microRNAs in myocardial matrix remodeling. Circ Res 2009;104:170–8, 176p following 178. Castoldi G, Di Gioia CR, Bombardi C, et al. MiR-133a regulates collagen 1A1: potential role of miR-133a in myocardial fibrosis in angiotensin II-dependent hypertension. J Cell Physiol 2012;227:850–6. Li H, Li S, Yu B, Liu S. Expression of miR-133 and miR-30 in chronic atrial fibrillation in canines. Mol Med Rep 2012;5:1457–60. Wang JX, Jiao JQ, Li Q, et al. MiR-499 regulates mitochondrial dynamics by targeting calcineurin and dynamin-related protein-1. Nature Med 2011;17:71–8. Wang Z. The guideline of the design and validation of MiRNA mimics. Methods Mol Biol 2011;676:211–23. Wahlquist C, Jeong D, Rojas-Munoz A, et al. Inhibition of miR- 25 improves cardiac contractility in the failing heart. Nature 2014;508:531–5. Karakikes I, Chaanine AH, Kang S, et al. Therapeutic cardiactargeted delivery of miR-1 reverses pressure overload-induced cardiac hypertrophy and attenuates pathological remodeling. J Am Heart Assoc 2013;2:e000078. Caroli A, Cardillo MT, Galea R, Biasucci LM. Potential therapeutic role of microRNAs in ischemic heart disease. J Cardiol 2013;61:315–20. Kauppinen S, Vester B, Wengel J. Locked nucleic acid (LNA): High affinity targeting of RNA for diagnostics and therapeutics. Drug Discov Today Technol 2005;2:287–90. Ebert MS, Sharp PA. MicroRNA sponges: progress and possibilities. RNA 2010;16:2043–50. Wang Z. The principles of MiRNA-masking antisense oligonucleotides technology. Methods Mol Biol 2011;676:43–9. Janssen HL, Reesink HW, Lawitz EJ, et al. Treatment of HCV infection by targeting microRNA. N Engl J Med 2013;368:1685–94. van der Ree MH, van der Meer AJ, de Bruijne J, et al. Long-term safety and efficacy of microRNA-targeted therapy in chronic hepatitis C patients. Antivir Res 2014;111:53–9. Dimmeler S. Development of miR92a inhibitors for the treatment of cardiovascular disease. DZHK Annual Report 2014. Available at: http://dzhk.de/das-dzhk/downloads/ (accessed 27 November 2015). Lau DH, Volders PG, Kohl P, et al. Opportunities and challenges of current electrophysiology research: a plea to establish ‘translational electrophysiology’ curricula. Europace 2015;17:825–33.